ZANZIBAR CITY, Zanzibar (CNS) — It was the poverty and sense of isolation that drew the Evangelizing Sisters of Mary to Zanzibar in the first place. But when the violence started, even destroying their own church, it was their commitment to peace that made them stay. “Many people tried to tell us to come back (to mainland Tanzania). But we said if we run away, we’re running away from the cross of Christ. How can we leave people here?” said Sister Yusta Tesha. Zanzibar is an island off the coast of Tanzania known for pristine beaches at tourist resorts and busy commercial ports. Mainland Tanzania is split evenly between Muslims, Christians and traditional beliefs, while Zanzibar is more than 95 percent Muslim. Arab traders who plied the coast of Africa throughout history made the island a central hub, and Islam became the dominant religion from their influence. There is a small community of approximately 11,000 Christians on the island of Zanzibar, out of a population of more than 1 million people. Though relations are generally tolerant, waves of Muslim extremism sometimes sweep through the island, fueled by radical groups who get support and inspiration from international terror groups like al-Qaida, al-Shabab and Boko Haram. The spring of 2012 — when an angry extremist mob burned St. Joseph Church in the Stone Town section of Zanzibar City — was one of these times of heightened tension. But the sisters remembered their African missionary congregation’s original call, its charism to go to the remotest areas. 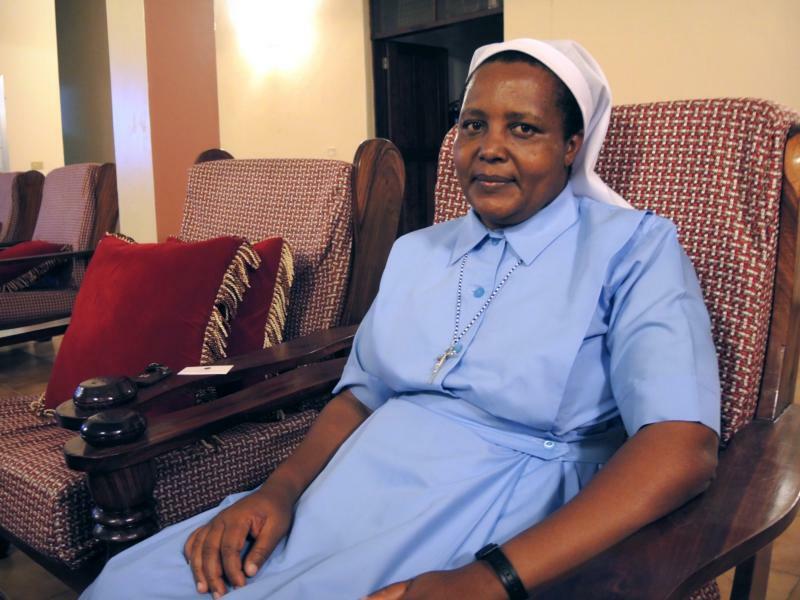 “The apostolate in Zanzibar isn’t converting them to Christianity, it’s helping them live as brothers and sisters,” explained Sister Yusta, who has worked in Zanzibar for five years. “What we’re doing in Zanzibar is interreligious dialogue in action. We interact with the Muslims, we try to find the means of helping them, and to live in peaceful coexistence,” she said in an interview for Global Sisters Report, a project of National Catholic Reporter. Sister Yusta and the other two sisters in her community spend most of their time doing pastoral work in the community. “We try to teach children about human rights, that they have rights as children, especially girls,” she said. The sisters hold seminars in the communities and local schools, talking about the importance of education for girls as well as the risks of human trafficking. Because Zanzibar is an island, it is a well-used stopover for traffickers bringing victims from mainland Africa to other parts of the world. Sister Yusta noted that in the conservative society of Zanzibar, women were sometimes confined to their homes. Zanzibar, which became independent in 1963, was incorporated into Tanzania in 1964 following the mainland’s independence in 1961. The name of the country is a combination of the words Tanganyika, the indigenous name of mainland Tanzania, and Zanzibar. Zanzibar has its own president and parliament. But tensions between the mainland and the island have existed since unification, with Zanzibarians claiming they do not get a fair share of government resources and support. The island is a popular destination for tourists who enjoy white sandy beaches ringed with palm trees that rival any Caribbean island. But tourism’s economic boost has not trickled down to the majority of the residents, who struggle to make ends meet as subsistence farmers or fishermen. The widespread poverty also makes it a fertile ground for extremists, who appeal to disenchanted, unemployed youth. The radical Muslim group Uamsho, “The Awakening” in Swahili, champions secession from mainland Tanganyika and imposing sharia law in Zanzibar. In 2011 and 2012, as Tanzania was in the middle of a constitutional review (the country still has not approved a new constitution), protests fueled by Uamsho and radical politicians agitated for a referendum on Zanzibar’s secession. The political situation riled up young people, who engaged in violent attacks against Christians and even a moderate Muslim cleric, Sheikh Fadhil Suleiman Soraga, secretary to the mufti. It was the middle of the night on May 18, 2012, when 100 angry young people surrounded St. Joseph Church in Stone Town, armed with stones and petrol. As three terrified Evangelizing Sisters of Mary huddled behind a locked door in the house in the same compound, the rioters smashed through the door of the recently constructed church. They smashed windows and doors, doused everything with gasoline and set it ablaze. Someone pounded on the door of the house where the sisters lived, admonishing them to come out, but they stayed locked inside. For three months after the arson attack, the sisters tried to avoid leaving their house as the situation cooled. A guard came to patrol at night. Violence spread to the mainland that October, when a Christian boy allegedly urinated on a Quran. Rioters in Dar es Salaam vandalized and burned five churches. Police eventually arrested more than 100 people. On Christmas Day in 2012, extremists shot Father Ambrose Mkenda, who survived. The violence against Catholics continued into February 2013, when extremists fatally shot Father Evarist Mushi as he was about to enter a church to say Mass. Attacks continued. On Aug. 7, men on a moped threw a jerrycan full of acid at two British tourists and volunteers from Britain walking to dinner in Stone Town. A few weeks later, extremists threw acid in the face of Father Anselm Mwang’amba, as he exited an Internet cafe in Stone Town. Tanzanian police eventually arrested 15 people in connection with the acid attacks, some associated with terrorism group al-Shabab. The attack against the tourists attracted the attention of the government, because tourism is such an essential part of the island’s economy. Eventually, influential Muslim religious leaders in Zanzibar called for calm, and the situation has been quieter for the past two years. Today, Sister Yusta and the other sisters continue their pastoral work in the slums of Stone Town while wearing their habits, which makes them easy to spot. But she said they refuse to back down or take off their veils. The Catholic community in Zanzibar is not well off, but Catholics united in the face of the church’s destruction. During the Sunday collections, they eventually gathered enough money to rebuild St Joseph’s. Today, a new church stands in the same location. The sisters take precautions, such as listening to suggestions from local leaders about places to avoid or traveling by car from place to place instead of by foot. “We try not to go alone anywhere or find ourselves backed into corners,” Sister Yusta said. But the Evangelizing Sisters of Mary will continue their mission in Zanzibar, just as they feel called to remote and inhospitable locations across Africa. Lidman, who is based in Israel, is the Middle East and Africa correspondent for Global Sisters Report.